The Flying Joe Coffee Shop, an independently owned coffee bar in Perrysburg, Ohio, is proudly committed to sourcing the best local ingredients for their food and beverages. It is for this reason that The Flying Joe has begun to source the milk which is used in their delicious drinks from Arps Dairy. The Flying Joe was seeking a local, high quality milk product to compliment their premium coffee, and Arps Dairy’s Farm Fresh product line was the exact fit they have been searching for. Arps Dairy’s Farm Fresh milk offers a number of benefits to The Flying Joe’s customers. In addition to being open and transparent about our farming practices, Arps Dairy’s Farm Fresh product line offers a consistent richness far beyond any other milk available which allows The Flying Joe’s artisan baristas to make consistently delicious coffee, each and every time. 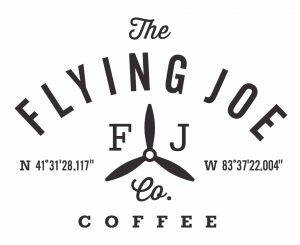 They Flying Joe was founded by Air Force pilots who strive to evoke the level of service found during the romantic era of aviation. They offer a diverse range of single origin coffees and espresso, sourced and roasted with care. Their baristas are trained to serve coffee using brew methods that highlight certain flavor, body and texture in any given coffee and are knowledgeable about which brew method will best suit your origin or flavor profile of choice. Arps Dairy would like to thank The Flying Joe and encourages all coffee lovers to stop and and enjoy an elevated cup of Joe.